COOKING BASES: How to make PERFECT gnocchi | Pasta & Co.
Gnocchi are perfect little ridged plump dumplings made with potatoes, flour (and eggs). And virtually anything you would like to add – be it beets for purplish/pinkish gnocchi, vitelottes for purple gnocchi, squid ink for black gnocchi, yams, pumpkin or saffron for a dark yellow/orangey tone and spinach and greens for green gnocchi. Very simple to prepare but, still, gnocchi have their downfalls, like water, the ratio potatoes/flour, kneading and the cooking time. The Italian culinary tradition calls for two different kinds of gnocchi. Potato gnocchi and round semolina gnocchi, with the latter being a traditional dish of the region of Rome. For Gnocchi alla Romana’s recipe, click here! Scrub potatoes under running water. Boil them unpeeled for 20-25 minutes (this will help keep the potatoes dry). Pierce one with a toothpick and if it goes through, they are ready to be drained. Do it once only, though, as water can really be a gnocchi downfall. Let the potatoes cool down until you can handle them. Peel the potatoes and mash them finely with a ricer onto a wooden kneading board, making sure you get rid of all the little lumps. Mix the potatoes with the egg, and add flour and salt. If the potatoes are very starchy, you will need less flour. Your dough should feel soft and smooth. Sprinkle a bit more flour – mi raccomando! (I implore you) limit the amount of flour you add (same as for bread) to make sure they won’t turn out heavy or rubbery. When your gnocchi dough is ready, put it on the side, clean your kneading board, dry it and sprinkle with flour. Lay some sheets of parchment paper and lightly sprinkle with flour (this is where you’ll place the gnocchi once they’re ready). 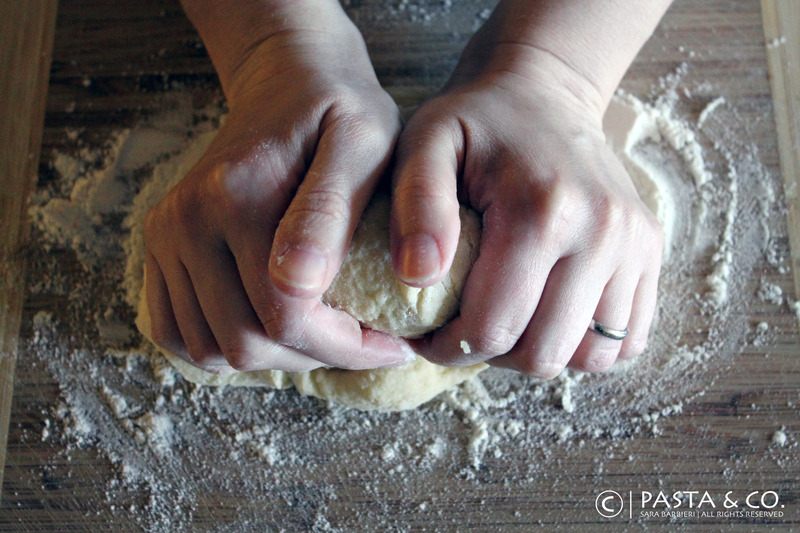 Cut off a small piece of dough, roll it and use a knife to cut out small bites. Use a gnocchi board to ridge the gnocchi – gnocchi need deep ridges to hold the sauce and to keep from sticking together. Watch the video to see how. As you shape the gnocchi, dust them lightly with flour and scatter them on the parchment paper. Repeat until the dough is finished. Fill a big spaghetti pot with 2/3 of salted water and bring it to boil. Add a tbsp of olive oil. Take the sheet of parchment paper and fold it in two so that the gnocchi all stay in the center, and let them slip into the boiling water. Do not overcrowd the pot. Keep en eagle eye on them: they’ll pop up and tell you they’re ready. Drain quickly with an asian strainer, plate up with your favorite sauce or dressing, and enjoy! I usually make a bigger batch and freeze them. You just need to line them up in a foil baking sheet / roast / pan layered with parchment paper, wrap it with cling plastic and put them in the freezer. Make sure the sheet/ pan is in horizontal position and let them stay for 3/4 hours. When they’re fully frozen, remove them form the pan, and put them in portions into Ziploc bags. When you want to eat them, just throw them in salted boiling water straight from the freezer. They’ll be as perfect as the fresh ones.